For a brief time Australia flirted with being a global leader in carbon pricing and emissions trading. The Keating Labor Government debated – and rejected – a national carbon price in 1995. In 2009 the Rudd Labor government proposed laws to establish a national emissions trading scheme, the Carbon Pollution Reduction Scheme, which then failed in the Senate. Instead, Australia became the first country in the world to dismantle a national carbon price, when Tony Abbott axed Gillard Labor’s carbon tax. Now Australia is in danger of becoming an outlier globally – and this will have significant economic costs as well as environmental implications. China first acknowledged this internationally in 2009 when, at the climate negotiations in Copenhagen, it announced voluntary measures to improve national energy efficiency, pledging to cut its carbon dioxide emissions per unit of GDP by 40-45% below 2005 levels by 2020. In 2014, China and the United States jointly announced their national targets and goals as a means of providing momentum for the following year’s Paris summit. 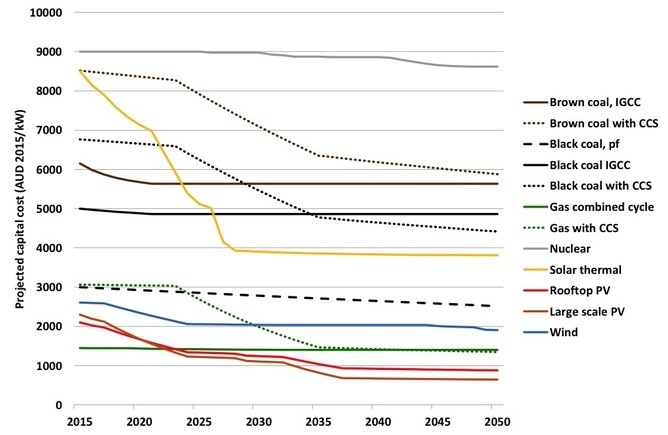 China committed to an energy intensity target for 2030, lowering carbon dioxide emissions per unit of GDP by 60-65% below 2005 levels, and also to peak its emissions before 2030. Seven pilot emissions trading schemes have operated in China since 2013. These subnational projects – in five cities and two provinces, including Beijing, Chonqing, Guandong, Hubei, Shanghai, Shenzen and Tianjin – together already cover some 26.7% of China’s GDP in 2014. During its trial phase, from 2017 to 2019, policy makers will work to help new participants become familiar with the new national market and to improve its design. The market initially will be restricted in scope and size. It first will only include carbon dioxide and, like its pilots, its initial carbon price likely will be modest. Nevertheless it is expected to cover some 40-50% of total Chinese emissions and eventually become a significant contributor to the suite of measures now being used to tackle Chinese emissions. Full implementation is expected to occur from 2020 onwards – with greater industry coverage, an increased percentage of allowances allocated by auction, and improved benchmarking. China’s heavy industries – economically sluggish, energy-inefficient and emissions-intensive – are under intensifying regulatory and now market pressure to modernise rapidly. While the carbon prices under the sub-national pilots have remained modest, they have added to this pressure for technological and economic reform. If a national carbon market accelerates improvements in energy efficiency in China’s metals and power generation sectors, its demand for Australian coal exports – already beginning to contract – is likely to fall faster. More and more studies are attempting to “value” nature by attributing (sometimes huge) dollar figures to things like threatened species. Apparently, this makes it possible to compare their value – for the record, a sea otter is worth twice as much as a sea turtle, according to one estimate. This fits within a wider approach that attempts to view and manage nature as an “asset”. Advocates argue that valuing the “ecosystem services” provided by “natural capital” and specific “natural assets” will ensure the environment is given due consideration in decision-making. Indeed, this week a diverse group of people from government, business and environmental organisations assembled at the World Forum on Natural Capital in Edinburgh to explore how and why this must be done. How we think (and write and talk) about nature has important implications for how it is appreciated and governed. Cognitive linguists George Lakoff and Mark Johnson made this clear in their seminal 1980 book Metaphors We Live By. Put simply, when we signify things through one metaphor rather than another, different realities are created. Embracing different metaphors works by reframing situations and enabling different questions to be asked. For example, while not without their own problems, metaphors such as “green infrastructure” and “ecological foundations” reframe the importance of nature in significant ways: anyone familiar with the classic children’s tale of The Three Little Pigs will attest to the importance of good infrastructure. In a similar way, “building” metaphors are already used to understand waterways and beach nourishment. There is potential to explore further opportunities in this area, including through metaphors such as ecological “renovation” and “restoration”. The importance of embracing new metaphors for nature is highlighted in an essay by US environmental scientist Thomas Princen, who wrote that “change occurs not when people argue well, but when they speak differently”. Using “building” or other metaphors can therefore help to understand nature in ways that do not commodify and financialise it. In contrast, the idea of “living with nature” re-imagines the relationship between humans and the world we live in. It does not view human-nature relationships through a narrow, commodified lens using concepts like “ecosystem services”. It avoids creating singular measures (such as dollars) to represent all the diverse ways we interact with and benefit from nature. Such a perspective aligns with an emerging body of literature that focuses on the ways in which we encounter nature in everyday situations, and the implications that arise from this. This highlights the fact that human understandings of nature are closely connected with our experiences of it. This forces us to consider the intimate and pervasive ways we encounter nature in our daily lives: nature is not just “out there” in national parks and wilderness areas. If we learn also to understand “everyday” nature, we will realise the coarseness of using economic metaphors to understand it. As others have argued, embracing economic metaphors serves to “work inside and perpetuate the very logics that have produced biodiversity loss in the first place”. Clearly, the use of economic metaphors is politically significant. For me, economic metaphors represent a continuing neoliberalisation of environmental policy: nature is only important to the extent that “natural capital” provides “good and services” that are viewed as having a financial value to humans. The reality, of course, is that our dependence on nature goes far deeper than money. New metaphors for nature and why it matters are needed so that new questions, new understandings and new answers can be explored. Perhaps it’s time for our political leaders, policy and business elites, and environmental researchers and practitioners to cast their minds a bit wider. Just over a year ago, Australia concluded a unique public policy experiment. For the preceding two years and two weeks, it had put a price on a range of greenhouse gas emitting activities, most significantly power generation. Now, 12 months since the price was removed, is a good time to assess the results of the experiment. The immediate effect of the carbon price was to increase the costs faced by most electricity generators, by an amount that varied between individual power stations depending on that station’s emissions intensity (the emissions per unit of electricity). These costs were then passed on in higher prices to consumers. Simple economics suggests that two effects should have followed. First, less emissions-intensive generators should have been able to increase their market share, resulting in an overall reduction in the average emissions intensity of electricity. Second, higher prices should have led consumers to reduce their consumption, cutting the total demand for electricity. When the price was removed, both of these effects should have been reversed. Let’s look at what happened in the National Electricity Market (NEM), which is the wholesale electricity market in every state and territory except Western Australia and the Northern Territory. 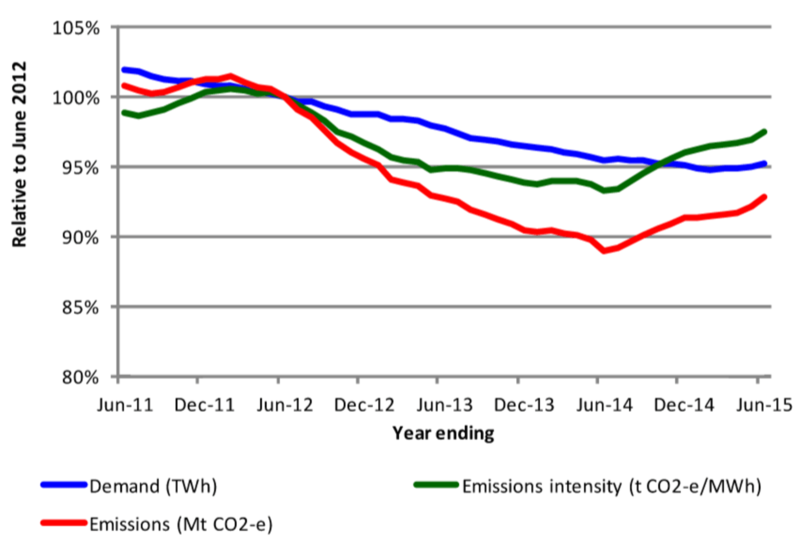 My analysis, using detailed NEM operational data from the Australian Energy Market Operator (AEMO) finds that emissions intensity, which was increasing until shortly before June 2012, fell continuously (see graph below) for most of the two years to June 2014. Since then, it has increased consistently. All these changes were caused by changes in the market shares the different types of generation, just as expected. Before, during and after the carbon price: relative changes in moving annual values for the National Electricity Market. Generation by both black and brown coal decreased under the carbon price, with the more emissions-intensive brown coal falling faster. Over the past year both have increased, with brown coal growing faster. It is plausible to assume that, had the carbon price remained, the earlier trend would have continued. Much of the gap left by reduced coal-fired generation between 2012 and 2014 was filled by increased hydro generation, particularly in Tasmania, which supplies about 60% of total NEM hydro generation. In 2013-14, hydro generation was 40% higher than two years earlier, but 2014-15 it fell back to below the 2011-12 level. While these changes appear to have been largely driven by the carbon price’s introduction and removal, it would be wrong to assume that the level of hydro output achieved in 2013-14 would have continued had the price been retained. The average output of a hydro power station is determined not by the capacity of the station but by how much energy it can access in the form of stored water, which in turn is determined by rainfall and run-off into hydro dams. This storage gives hydro generators some flexibility to choose when to generate. When the carbon price was introduced, hydro generators, with no carbon price to pay, were able to make windfall profits. But the hydro generators, especially Hydro Tasmania, anticipated that the carbon price would be short-lived and so generated as much as they could while it was in place. Hydro Tasmania achieved its highest ever annual profit in 2013-14, exporting large quantities of electricity to Victoria while also supplying Tasmanian demand. In doing so, it ran down its energy in storage from 61% of maximum level in October 2012 to 28% in June 2014. With more certainty of a long-term carbon price, they hydro generation industry may not have pushed itself so hard. There is no clear trend in the rate of demand reduction after the carbon price was introduced. Separate analysis has shown that the demand reduction seen in the NEM since 2010 was due not to the carbon price but rather to a dramatic reduction in household electricity consumption and the closure of two aluminium smelters. The sharpest change in demand occurred between 2010 and 2011, a period that saw price increases in most state markets, caused by a hike in transmission and distribution costs that was considerably larger than the price increases due to the carbon price. This was also a time when higher electricity prices became a high-profile topic of political debate, both because of the price rises and also because of a successful scare campaign about the possible effects of a carbon price. It seems that many householders were looking to cut their power use even before the carbon tax arrived. For five years, from 2010 to 2014, residential and business consumers steadily reduced their electricity consumption, largely because of improved energy efficiency. It is possible that, with the carbon price now gone and emissions rising once more, this trend has now come to an end. Perhaps the price decreases have persuaded many consumers that they have now done enough, although after five years of growing energy efficiency it is equally possible that the range of efficiency measures has simply been largely exhausted. If we are thinking of the carbon tax as an experiment, I have drawn four main conclusions. The first is that many factors besides the carbon price have influenced changes in the behaviour of electricity consumers and suppliers, so it is not possible to isolate the effect of the carbon price alone. The volatility caused by the short duration of the carbon price may even have been a factor in itself. Second, notwithstanding this complexity, the carbon price induced the sorts of changes in both supply and consumption that economic theory would have predicted. This is consistent with an earlier analysis done immediately after the end of the carbon price. 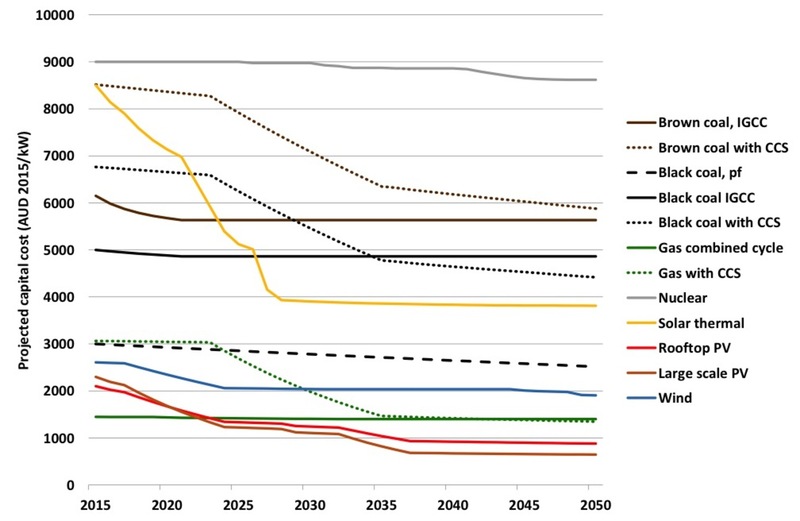 Third, the rather modest size of the changes is also consistent with the theoretical expectation that major changes in electricity markets depend on large-scale investment. This means that larger impacts of a price on carbon will only appear if the policy is maintained over the long term. Hugh Saddler is Research Associate, Centre for Climate Economics & Policy at Australian National University. The link below is to an article reporting on how the IMF recommends a $US20 a tonne carbon price, which is only slightly less than Australia’s July 1 price.